Artist Pointer is critically questioning the role of the artist in a process of exhibiting digital art, no matter if existing of software only or if the work became physical through digital manufacturing, like 3D printing, 3D milling or laser-cutting. Any work that is creating digital files have this huge benefit of being distributed through the internet around the globe within seconds. Moreover, clones and copies of infinite number can be produced through the capabilities of digital information. Artist Pointer, like any digital art, has a digital DNA, no matter if it exists as software only or if it becomes physical in an exhibition through digital manufacturing. Therefore, digital art can be downloaded and exhibited everywhere and by everybody who has internet access and theoretically without the artist’s involvement. This is fundamentally different to analogue art, where usually an autograph is indicating the creator of an art work. With Artist Pointer I am questioning the artist’s visibility in digital arts. Artist Pointer is a location sensitive replacement of the artist’s autograph as it will – where ever the exhibition is and I (the artist) am – always point at me. 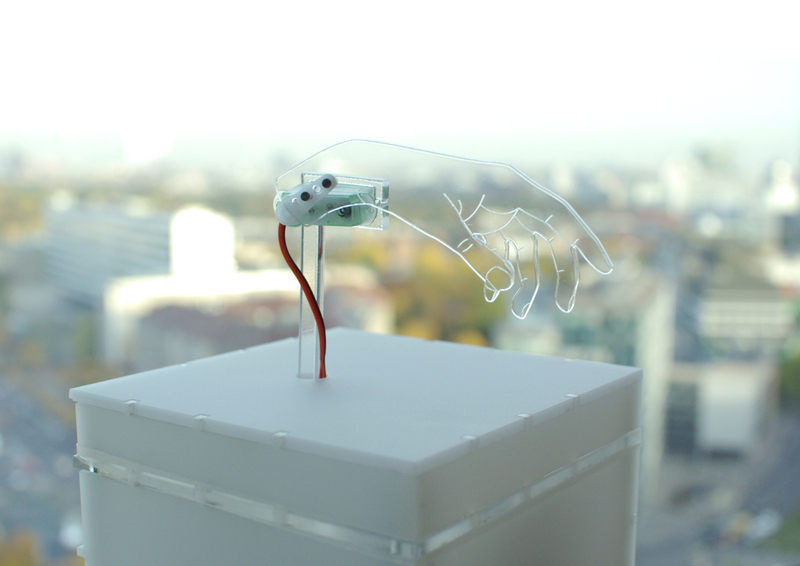 The Artist Pointer was a project of the Digital Class at Berlin University of the Art with Professor Joachim Sauter and Professor Jussi Ängeslevä and was shown at Parsons New School of Design in New York 2012 and at UdK DesignTransfer in Berlin 2013 in the Exhibition Prototype – An Exhibition in the Cloud.